We CAN'T WAIT to expand to PARKVILLE this summer/FALL! Here's the deal,though - we aren't there quite yet. however, since you're the cool early adopter, you get to sign up now and save later. If you sign up, use the code 'PARKVILLE25' and we will give you 25% off your first THREE monthS. not ready to start service but just want to receive updates? Click here to receive our newsletter to stay in the know. 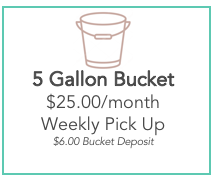 By signing up for composting service, you agree to our terms and conditions.